This evening your favorite ComicMix columnist (Me. That would be me. Yes? Good, I'm glad we're on the same page here) learned the devastating news that, despite the amazing Deadpool test footage that caused excited spontaneous combustion amongst fans, and Ryan Reynolds' many excited tweets about his role in the upcoming Deadpool movie and his official Deadpool costume, 20th Century FOX has decided to cancel the film. A FOX executive, who asked not to be identified, explained the decision thusly: "Well, this morning while we were eating our gold dust-iced donuts and drinking our hand-ground artisan coffee, we started debating whether to make the movie PG-13 or R. Ryan [Reynolds] was in the room, and he's been advocating for an R film since the beginning; but he's just an actor and a Deadpool fan, so I mean, what does he know? Anyway, the debate got heated, and then it turned into a wrestling match on the conference table, and then before we knew it there was an all-out punch fest going on, because, I mean, Ryan gets very worked up about these things. And blood was flying everywhere, and it got on my new silk tie, and basically at that point I just had to put my foot down and tell everyone that if they couldn't play nice, they couldn't have nice things. So we're cancelling the Deadpool movie. People are too invested. And if my execs and actors are so invested, I can't even imagine what the fans will be like. I mean, we can't have FOX on the hook for riots in the street and stuff if we don't give them what they want. You saw how mad they were about our first Deadpool SNAFU. We can't risk another." When asked if he didn't think fans would be more upset by cancellation of the movie, which had already been stuck in development hell for an incomprehensibly long time before being greenlit, the executive replied, "Huh. I hadn't really thought of that. I guess they'll get over it. I mean, they got over that Firefly thing eventually, right? ...Or did they? Oh well. Too late now. We already allocated the remaining Deadpool budget to Alvin and the Chipmunks 4." After hearing this immensely depressing news, I reached out to Deadpool screenwriters Rhett Reese and Paul Wernick for comment. Reese returned my call. "We tried so hard to get the movie made!" he said, sniffling a little into the phone. "I can’t believe it’s not going to happen. February 12, 2016 will feel so empty now. But I’m on Ryan's side here. If you're going to do Deadpool, you have to either go hard [R] or go home." Reese then excused himself to go work on his current screenplay, which, he informed me, features zombies attacking a film studio and its head executives. I also reached out to the Deadpool star himself, Ryan Reynolds. He agreed to a Skype video interview; which revealed that the usually dapper Reynolds was taking the cancellation news very hard; at least if his unshaven, unwashed, bathrobe-clad appearance was anything to go by. (Also, he was eating cookie dough ice cream straight out of the carton and looked suspiciously red around the eyes.) Reynolds appeared slightly unfocused and fairly distraught as I asked him how he was bearing up under the news. ...Squirrel Girl? Hrm. I’m a great supporter of Reynolds’ work; but I think the announcement that the Deadpool movie has been cancelled may have sent him over the edge. Still, at least auditions will get him away from the ice cream and out of the house. Now if only I and the multitudes of other disappointed fans could figure out something that would do the same for us. I guess...I guess I’ll go off to work and try to live my life like a normal, non-sad-nerd person, huh? Yeah...that. Just, please, nobody tell me any more bad news today, okay? I don’t think I can handle it right now. Even if it’s just a joke. @foresthouse: Wow, I follow a metric ton of people on here. How did that happen? @foresthouse: Generally I don't follow without reason, so I don't unfollow without reason either...but I can't remember why I followed a few folks. Hah. @foresthouse: It would be really interesting to see inside people's brains as they decide who to follow and why on Twitter, and all that. @foresthouse: --are a friend of a friend, if your tweets bring me news or make me laugh, if we talked a few times & I'd like to know you better... Heh. @bicyclefish: @foresthouse I try to put pple i follow onto private lists so i remember why but i often forget to do that. @foresthouse: @bicyclefish I have a lot of private lists but when I add people on the go, it's not as easy to put them on lists, & I forget to later. @foresthouse: Also there's the whether you're following me too; and the whether you're not but it's okay because you're a news site or whatever. @foresthouse: And then there's whether a bunch of ppl I follow are following you even if I can't remember why I did, because I must have had good reason. @foresthouse: Or if you're a fellow Deadpool or Discworld or other fan; or if you follow one of my fictional character accounts & I like your feed. @foresthouse: There's a big, "We chat on Twitter and you seem nice/fun to talk to" swath of people I follow, too. @foresthouse: There's also the, "I know you from another community" group. Holla, Snarkers! @ghostwritingcow: @foresthouse Seriously. I have no idea why some people are following me. @foresthouse: @ghostwritingcow Totally. Sometimes w/ me ppl I've chatted w/ IRL don't follow me, even though they do on other media or I know they like me. @foresthouse: @ghostwritingcow And then, like, a celeb I've never met or tweeted about follows me. Which is totally cool! I just wonder how they found me. Heh. @nsfinch: @ghostwritingcow @foresthouse Theres some kind of activity or statement or someone you follow that triggers their algorithm. @foresthouse: @nsfinch @ghostwritingcow Ohhh, I see what you're saying - so some people may have found us via that "you should follow" type thing. @foresthouse: @nsfinch @ghostwritingcow And I'm sure there are people I follow who are like, "Who is this person and why does she follow me?" @foresthouse: And then I'll admit there's a V small group of "I don't really like you but I want to keep an eye on what you're up to" ppl I follow. HAH. @redheadedgirl: @foresthouse Oh thank god, it's not just me. @foresthouse: There are also some people I follow who, if I WERE to make a list called "I adore your awesomeness," would be front & center. @nsfinch: @foresthouse @ghostwritingcow You know all those people whose bios say they're "social media consultants"? Some people really do hire them. @foresthouse: @nsfinch @ghostwritingcow I know. It makes me feel slightly icky, when it's for Twitter. Twitter should be about real interactions. @ghostwritingcow: @foresthouse @nsfinch I think Facebook should be about real interactions. Twitter is kind of a free-for-all. @foresthouse: @ghostwritingcow @nsfinch Yeah, but I mean, you shouldn't follow somebody because you are a PR bot. @ghostwritingcow: @foresthouse @nsfinch Also how can you think Twitter should be about real interactions? You run fictional character accounts! @foresthouse: @ghostwritingcow @nsfinch I'M COMPLICATED, OKAY. SO IS DEADPOOL. SHUTUP. MT @nsfinch: Tweets Loud And Quiet: http://j.mp/JTRQFT . @foresthouse: "just under one in every thousand Twitter accounts has a name that refers to Justin Bieber in some way;"
@foresthouse: "an additional one in every thousand refers to Bieber in its account description." ‏@foresthouse: And thus begins the fall of humanity. Tonight I babysat for my adorable 3-year-old nephew Benji while my sister went to a work event. He was very good! We read 3 books, and ate dinner (mostly) neatly and without major mishap ("I dropped a piece of pasta on the floor but if it goes on the floor that's okay because we can clean it up, Auntie Em!" he said, repeating what I'd told him 5 minutes before). He's a very sharp little kid and gets more personality every time I see him. One of the books we read was from my & my sister's childhood, about the Fisher Price "Woodsey" family toys. The books were sold with little log or birch-tree looking houses made of cloth and plastic, with plastic furniture and the actual Woodsey characters (the main family being squirrels) to go along with them. You can move their little puppet arms with your fingers, and when you squeeze them they squeak. They're pretty cute. :) My parents gave Benji the two houses and the animals we had, along with 3 books, a while ago. Reading these particular books with Benji is hilarious, because Benji re-named the main characters after our family, so when you read them, you have to read them with the "proper" names (e.g. Milkweed the little squirrel boy becomes Benji). The best part of this is that since there's no aunt character in the book, I got named after the bluebird who delivers the mail. Amanda brought the bluebird book along with Benji's toys today; so I read a whole book about "Auntie Em" delivering mail to allllll the Woodseys. Hee. I took a hilarious video of Izzy being stuck after Amanda and Benji left. In the ball she can get over small bumps in the floor (like between the living room and the kitchen) if she gets momentum. But she's so small that if she doesn't have space to run up to things, she gets stuck. It is so pathetically cute. Heeeeee. I wanted to keep filming her adorableness, but I also felt bad for the poor wee stuck hamster, so I helped her out. If you liked that video, by the way, there are several more here, and trust me, if you haven't seen the one where she eats a seed, you really should. IT'S SO CUTE. ...I love my hamster ridiculous much. Speaking of ComicMix, any comics subjects you'd particularly like to hear my thoughts on? I have plenty of column ideas already, but if anyone has a topic they'd really like me to write about, let me know! Switching topics completely, another thing that's happened recently is that I GOT NEW CONTACTS. They are very scary looking GIANT hard contacts called scleral lenses, but aside from being a bit hard to put in, they are AWESOME (!!!!!). The way they work is that they sit on the white part of your eye instead of the cornea, and they have a "reservoir" in the middle which provides space for preservative-free eyedrops. Because of these things: a) I no longer get the unpredictable stabbing eye pain caused by the edges of the (smaller) lenses hitting my irregularly shaped corneas (the irregular shape being from the keratoconus). This used to happen to me at random times several times a day. No more!! b) I no longer have to use eyedrops at alllll hours of the day (I used to freak if I didn't have eyedrops with me because my eyes could get randomly, painfully or cloudily dry AT ANY MOMENT. Now, I use eyedrops MAYBE once or twice a day if I'm wearing the contacts a long time, but can survive without them if needed.) c) My vision is so much better. Seriously, y'all, I haven't seen this well in maybe 2-3 YEARS. YEARS. I CAN READ THINGS FROM VERY FAR AWAY. STUFF IS NOT BLURRY. STUFF IS SHARP. OMG. I cannot fathom why nobody recommended these to me sooner, except that they aren't as commonly known or used; but for keratoconus sufferers, they are GREAT. One package = enough for one contact. About 35 cents per eye. Kind of pricey but not terrible. BUT the catch is, if you mess up while putting one in, you have to open another little package and re-fill the contact, because it has to be completely full when you put it in. I'm getting pretty good at putting them in (1-5 tries per eye, usually) but a few days ago it took me EIGHTEEN tries to put in just one contact. That's...six dollars and 43 cents to put in a contact. *siiiigh* But like I said, I'm getting better at it, and also: I DON'T CARE I CAN SEEEEEEE. Anyway, to put the contact in, you put it on this crazy looking suction cup plunger thing, fill it with the drops, and then, while looking straight down at yourself in a mirror (i.e. face parallel to the floor/flat mirror), attempt to put the contact on the center of your eye without spilling any drops and then squeeze the little plunger to pop it off into your eye. (AIEE!) If you DO spill a bit, and you end up with an air bubble? You have to use a completely different little plunger to remove it, and start all over again. (This is why it gets expensive.) But hey: VISION. I'm pretty pleased with how they turned out. Aaaand in my last bit of news, I've finally joined Pinterest. Here I am! I don't post all the time, but I did go through and try to upload a lot of my craft pictures, so I have some jewelry up, and some clay, and some sewing stuff, and some paintings/drawings. So, you know, if that stuff interests you, check it out! And add me! I don't have too many people I'm following on there yet. Whew! So. That's what I've been up to. And now: BED. Good night, world! You guys (if any of you still read this?!) I am so terrible. I keep writing the beginnings of LJ entries, meaning to post things, running out of time, losing my notes about something I wanted to write, getting distracted by other things, not finishing drafts of posts, and...geez, I just haven't posted SO MANY things I've wanted to lately. Gah. On the other hand, one reason I haven't posted here is that I've been writing some for other sites recently. So even though I'm totally planning to post more here VERY SOON, in the meantime if anyone wants to, I'd love for people to check out some of the things I've had up recently at other sites. I've had a lot of fun writing these! Also for anyone who doesn't know, over the last couple of years artist Marc Vuletich and I have done a series of webcomics, the majority of which have been featured on movie and TV news site Reelzchannel.com (along with a couple of articles I wrote). If anyone feels like catching up on those comics or checking them out, they're all conveniently linked at my Ask Deadpool Wordpress blog. Following on that, our most recent two webcomics, part of a three-part series about the Marvel Avengers movie that comes out next weekend, have just been featured on MTV Splash Page! Here are links to the first two, and the final part will be coming out on Splash Page this Wednesday. WOO! Please check 'em out! Finally, in writing things, beginning this week I will have a weekly column over on ComicMix, discussing comics and comics-related things. This is slated to go up every Tuesday at 1 p.m., so please check those out! This week I'll be chatting about a few different things, and next week will feature a review of the Avengers colognes and perfume from JADS International (tested on a Genuine Comic Book Artist!). I have lots of fun ideas for future columns over there, so if you like comics, please read! And now...I have to go finish writing a column. More soon!! At the National Press Club, we do one or more book events per month, where an author with a new book out will come and talk, answer questions, and sign books that are purchased there from Barnes & Noble, and that raise a bit of money per book for the non-profit journalism library. Lately there's been some discussion regarding how to adjust this event model to the growing popularity of e-books, and I wondered if you all have any thoughts on this (being, at least some of you, e-book readers). So, for the e-book readers here, here is a poll! Ta-daaaah! Also feel free to leave your thoughts in the comments. Poll #1813379 The Future is Bigger on the Inside! Do you still buy regular books as well as e-books? No. Silly heavy tomes are now obsolete. Only for special books or authors, or a collection. At an author event, would you still prefer to buy a paper book? Why would you buy a regular book at an author event? To get it autographed. Scribble scribble! Convenience! The book is sitting right in front of me. That's part of the fun of the event experience. I like to own some regular books, too. The author or series is special to me. I wouldn't buy the book. Are there some authors or series' that you will always buy the paper book for? Who? At a book event, would you prefer to buy an e-book if it was available on the spot? What would be the best way to set up e-book sales at an event? Autographs: would you still want to get something signed even if you bought the e-book? Yes, that's the best part! Eh, it's not that crucial to me. I'd get my e-book or cover signed. Is there an app for digital signatures now? I want that! What if a book is only in e-book format? Would you still attend the event? So, if you don't live in a cave, you've probably noticed that today, a bunch of websites, including Wikipedia, have "blacked out" in protest of "SOPA" and "PIPA," or are providing links to protest the bills (see Google), and they're being discussed all over the news and Twitter. Maybe you even know what these two bills are, and why they're a very bad idea. But just in case you don't, here's a hopefully helpful little round-up of links and discussion of why these bills, very similar to each other and currently making their way through Congress, are important for every single one of us to know about, and why they should not be allowed to pass. Also: what you can do to help protest them. Here's the House bill, the Stop Online Piracy Act, on Wikipedia. And, just in case for some wacky reason you think that's biased or something, here's the bill's official summary, which is a bit harder to read (paragraphs would be helpful, guys!). And here's the full text for SOPA. Here's the similar Senate bill, PIPA, on Wikipedia. And the bill's official summary. Although the purpose (preventing infringement of intellectual property) is admirable, SOPA and PIPA are overbroad, and have a huge potential for abuse or misapplication. This is both my opinion and the general consensus of informed people and entities who are protesting the legislation. If enacted, either bill could change everything we know about how the internet works today, and negatively affect a lot of online activities that have nothing to do with copyright and trademark, or that would be defensible under Fair Use, etc. and are not currently targeted. Either could also have a serious chilling effect on web creativity, entrepreneurship, and speech. At this time, there has been huge opposition to the bills by internet users and internet companies and websites, among others. Examples include: blackouts by major sites such as Wikipedia, Reddit, Craigslist, Wordpress, etc., partial blackouts by other sites like Google, Etsy, LiveJournal, etc. (sites still available but featuring info and links on how to protest the bills to Congress), 97% and 96% opposed on the polls linked to both bills on the govtrack.us site, and relevant opposition hashtags trending on Twitter. Primary supporters seem to be big entertainment companies, such as the MPAA (who spoke out against the blackouts as a publicity stunt, rather than the statement against government over-reaching that they are). Honestly, I haven't seen a ton of statements in support of the bills, but what has come through are from the big movie and music companies. The White House has issued this statement recently, in which the Obama administration has indicated that he would veto the bill in its present form. This has sent legislators back to the drawing board to work on redrafting or amending the current bill in order to "reach a consensus." This isn't the end of things, however - they are working on SOPA, which presumably will move forward soon, and PIPA is slated for a vote on January 24, with Senate Majority Leader Harry Reid rejecting requests for postponement and saying "this is an issue that is too important to delay." I'd argue that it's also too important to rush through, Senator Reid. One of the biggest problems with the current proposed legislation is that it's overbroad. I'm seeing a lot of folks saying, "Would Etsy shut down? Flickr? How would my podcast be affected? What would happen to YouTube? Will Wikipedia go? What about open-source sites? And on and on and on. Major sites like Wikipedia have immediate concerns about the broad effects of the potential law. Tiny players like someone with a personal blog have the same concerns. And here's the key: these people are the Internet. We are all the Internet. And we will all be affected if this legislation passes. From the biggest informational or search sites, through the news and humor sites, through the big stores and quirky craft shops, through the discussion forums and social networks, to your own little blog and Twitterfeed, and much, much more, we, as a whole, make up the Internet. And so legislation that is meant to govern the internet has to consider and make clear the ways in which such legislation will affect us; all of us. And these bills, in all their vague glory, do not do that. This is why we must care about them, and protest them, and advocate better solutions. I'm not suggesting legislation addressing the effect on every little website; but I'm suggesting, at the very least, clear guidelines and perhaps protections for websites, as opposed to just the attacks on infringement that are currently proposed. And I'm suggesting legislation that targets the mosquito instead of the entire forest it lives in. I'm an attorney, with an education and background that includes IP law, and I could not predict offhand all the myriad ways that these proposed laws might be applied with negative and unnecessary effects, or how Esty or your little blog, or numerous other things, might be affected. But I can see how the legislation could be misapplied or abused, and change the internet as a whole. And both of those things worry me. And they should worry you, too. If they do, one good way to express those concerns, and your reservations about the bills, is to call your representative in Congress. Or email. Or tweet at them. There are tons of ways to make your voice heard. It's interesting to note that at a November House Judiciary Committee hearing, numerous observers noted that the set of speakers who testified regarding SOPA lacked technical expertise. Here's a choice quote: "the techno-ignorance of Congress was on full display. Member after member admitted that they really didn’t have any idea what impact SOPA’s regulatory provisions would have on the DNS, online security, or much of anything else." That is, well, just ridiculous, and is yet another reason to oppose the current bills. That writer also makes a good point, which is, essentially, it's not enough to protest when you see a proposed law that is a bad idea (although that is one important act). If we don't want Congress fumbling around with things they apparently know little about, and making bad laws, people who are more informed or see the problems inherent in the proposed legislation need to get into the action, with public comments and proposals that would target the relevant issues without the negative concerns we have here. With raising specific concerns for Congress to look into. With asking questions and trying to ensure Congress is on the right track. With ensuring our concerns are represented well before the final draft of a bill. Because even if SOPA and PIPA are defeated, Congress is going to keep trying: 2008, 2010, 2011 into 2012, they've been trying to get things like this passed; and really, it's not inherently evil of them to do that. There's nothing wrong with protecting intellectual property, and to be against SOPA or PIPA is not to be for piracy. It's just to be for better solutions to it. I realize that the status quo is such for a reason, and that people are not really motivated to do what is Congress's job, or what runs the risk of negatively impacting their current state of being - but maybe it's time for people who really care about how the Internet works and has benefitted our society to think of ways to improve IP protections online without infringing on everything else we value about it. Ways to do this include everything from thinking and talking about viable and fair solutions online, to participating in the public comment period that is available when proposed legistation is published in the Federal Register, to getting lobbyists to advocate for our concerns from start to finish, as this group is now raising money to do (feel free to donate! ), to...whatever other brilliant ideas you have. I know you all have brilliant ideas, because after all - you're the Internet. Which is brilliant. I hope it stays that way. @foresthouse: Google & Wikipedia and others have info on how to easily contact your gov't rep & help #stopSOPA. It's simple & quick. @foresthouse: If you don't do anything else re: #stopSOPA today: load @Wikipedia, stare at that grey page for a minute, & imagine it always being blank. And see: An open letter to Washington from Artists and Creators, via Neil Gaiman. A leetle smidge of Twitter? @foresthouse: Ladies and gentlemen: SNOW. @foresthouse: But only a leetle. @foresthouse: PS A "leetle" = a unit of measurement smaller than a "little" and like unto a "tad" or possibly a "dab," but cuter than any of those. @Eviey: That's so adorable and awesome I need to lay down for a minute. @foresthouse: @Eviey Of course, in proper usage, when saying "leetle," one may also illustrate w/ a wink & a hand-motion indicating a pinch, as in baking. @cue_face_palm: @foresthouse Where would a "smidge" fall into this unit of measurement? These things are important. @foresthouse: @cue_face_palm A smidge is smaller than a leetle AND a tad, but only a smidge smaller than a dab. ;) 2 smidges = a dab. @foresthouse: @cue_face_palm Well, that's why you have me, font of all Ridiculously Subjective Measurement knowledge. @foresthouse: @cue_face_palm But contrary to what popular thought might dictate, the smidge is actually slightly smaller than the smidgen. @particle_person: @foresthouse I think we are on the way to a new system of measures if you include @cleolinda's work on fucktonnes. @particle_person: @foresthouse A leetle smidge, for example, is the amount a person on a diet wants of your sundae. @particle_person: A leetle dab is the amount of chocolate sauce your grandma thinks is on the tip of your nose after eating the sundae. @particle_person: A fucktonne is the amount of chocolate sauce you asked your server for when grandma was in the ladies' room. Hello, hello, to anyone still out there. :P For a number of reasons (busy? stressed? BUSY) I haven't really had time to blog in awhile. HOWEVER...I might try harder in the new year? I do miss it, I just never seem to have the time. Um. MAYBE SOON? - Christmas was fantastic; celebrating with the family is always good, and was extra-fun this year with my sister and BiL's 2.5 year old boy and 6 month old girl. Kids. Presents. SO CUTE. :D My sis reports that Nephew loves the turtle nightlight I got him (it shows constellations on the ceiling, in 3 colors that you can select) and Baby Niece loves the snuggly seahorse (it plays lullabies and its tummy lights up, aw) as well. Yay! I got some very cool things, like an iPod speaker and a Kindle and (HAHAHAHAAAA!) a Deadpool bank. Heeee. Did you all get anything fun? - The location for the next North American Discworld Convention has been announced. It will be in 2013 in Baltimore. Woo! Local! Although I have "retired" from being involved in planning, I am looking forward to attending!! WHO ELSE IS GOING TO GO? - I seem to have been seeing a number of movies recently. I got to go to the advance screening of Sherlock Holmes in December (it was SUPER); I was fairly unimpressed with Immortals (although the cinematography was pretty good, it just draaaaagged); and The Girl With the Dragon Tattoo was intense, good, and DISTURBING. I had 3 nightmares in a row the night after I saw it (!!). ...Anyone else see anything good recently? - Ummmm...yeah, that may be all for now. Maybe I haven't blogged recently because I'm BORING. Heh. But I still love y'all. Happy New Year!! The internet is a weird, wild place. One of the glorious things about it is the ease and immediacy with which we can communicate, share, create, sell, add and delete online content, and more. This is also one of the most problematic things about it, when it comes to intellectual property law (And here's a discussion of some of the reasons why it's so problematic from the last time a friend had work infringed upon via the Internet). Today, yet again, a friend of mine had copyrighted work infringed upon via the Internet, and in this instance, not only was there infringement, but it was infringement for profit, and without acknowledgement. That's pretty much like stabbing a creator in the heart and then twisting the knife. Here, I'm talking about the amazingly talented comic book and pulp artist Francesco Francavilla, who called out Teefury.com today for infringing on a work he created in 2006. The image is of H.P. Lovecraft and Lovecraft's creation Cthulu, and was based on an old photo of Lovecraft. Francavilla sells the image on t-shirts and other items himself. Teefury.com's image strongly resembles Francavilla's original art, in ways that go beyond a possible shared photo reference, and that would hinder an argument that Teefury's work was sufficiently transformative (i.e. created a new work) and thus defensible under fair use (which is, as I constantly remind people when I post about copyright, only a defense, not a right). As the linked ComicsAlliance article states, and as I can also see plainly, there are several points of commonality that I believe would lead to a finding for Francavilla if such a case were to go to court; the most telling being the distinctive design of the left (or Lovecraft's right) eye, which Francavilla originated. It's clear that the Teefury "artist" MUST have seen Francavilla's work, since such a detail is extremely original and not the sort of design element anyone drawing Lovecraft would immediately include. But the problem here is not just the infringement; it is also in the nature of the way the Internet functions, and the way the Teefury.com website is set up, which could appear to limit the benefit for an artist of pursuing the infringement by the most common method of recourse, a cease & desist letter. Because Teefury.com only sells each tee-shirt for one day, by the time a traditional cease & desist-type letter demanding the art be removed was to be sent out and responded to (assuming a response), the tee-shirt would already have been taken down anyway as part of the course of ordinary business at Teefury; thus allowing the infringer to "get away with" the infringement for a day, while depriving the original artist of at the very least the satisfaction of knowing that they had successfully caused the infringing work to be removed by the infringer. It's a frustrating position for an artist to be in, to say the least; and it makes it easier for the website to get away with being a repeat offender, since an artist doing a cost/benefit analysis might assume the cost of taking action would outweigh the minor benefit of removal a few hours early, if at all. What makes it more frustrating is the attitude of the infringer in this case (who, incidentally, makes a bald-faced claim to being the "artist" of the Lovecraft piece). This guy, who is actually one of the employees of Teefury (the "art director," as opposed to being a member of the public who submitted a work) has clearly expressed his blatant misunderstanding of U.S. copyright law and his disregard for the rights of artists, in a post entitled "STFU Comparison Police! Advice to Artists. His idiocy about the way copyright and fair use works would be laughable if it wasn't actually causing harm to artists. But cause harm it does; not only in the infringement itself, but in the possible lost profits, and in the propagation of an attitude of irreverence towards copyrights and ownership amongst internet know-it-alls who think they're in the right when they are not, and encourage others to follow their lead. * (Though I'd love to see their reactions were someone to treat their works the same way and profit from them; I daresay there'd be some general about-facing and a quick hue and cry would be raised if the tables were turned). That's why I would encourage artists to follow up on infringement anytime they possibly can; and, more importantly in cases such as this, to keep in mind that asking for an infringing work to be removed is not the only recourse an artist might have; in the instances where an infringer is making a profit, always remember that a copyright owner can demand an accounting of any profits, and a remittance of any profits derived from the work. I also encourage people like the infringer over at Teefury to read up on U.S. copyright law, in hopes that they will realize they are, in fact, breaking the law, and it might just come back to haunt them. *ETA: And, as J. Robert Deans of Twitter points out, there is also the harm of a day of lost work and income due to this issue distracting the artist from his current project. - I got to see all the pretty thingssssssss and wander around and just generally BE at a comic con again, which was nice because it'd been awhile. I love comic cons. They are good for my geeky soul. - Take enough pictures (I'm usually better about remembering to do that). But I DID take these pictures HERE, and also picked up some neat art (pictured). Woo! So check that out! Extreme sports just got an upgrade! No more skateboards, rollerblades or BMX bikes, when these superpowered kids take to the streets, there's no telling what they can and will do in this underground, full contact, no-holds barred sports league. From all across NYC they come to do battle, pitting their powers against one another in do-it-yourself style Olympics. They fight for fame, they fight for glory, they fight to be the the Power Play champion--and in the middle of all of this is Mac, a college student looking for direction and purpose in the big city. Who will be crowned King of the Five Boroughs? Power Play, the super-powered street games starts here! I like the concept - it's fun, it's different, and it has the potential for good character development/interaction/conflict. The dialogue's snappy so far, and the description of Westside Flame actually made me laugh out loud. In the preview itself, we get what seems like two snippets of different but related storylines; a glimpse at the sports/competition part of the story, and a glimpse at the personal/character development part of the story (focused on Mac), both of which look good. The presentation is a little disjointed (going from action to introspection with little transition is a bit jarring), but I give that a pass because it's a preview comic, and I don't think the intention was to put up a complex, integrated story at this point. Presumably in the main comic we'll get a more cohesive story, and I'm looking forward to it. I'd also love to see more background on the league, which I'm sure will come up along the way. I love the art, but then, that's not surprising. Reilly's one of my favorite comic book artists; I like the dynamic way he draws characters and action, and also a lot of the facial expressions. I'm enjoying the character designs so far; I have to admit I already have a straight-girl-crush on the Ice Queen character (I can't help it, she's purrrty. And also wearing my favorite color of blue, with SNOWFLAKES. I love snowflakes. I even have tights with snowflakes on them. (See also: butterflies. :D). And I, also, am intrigued by Gowanus Pete (and want to see what else they turn Mac into). Reilly does a great job with the different character designs, matching the style to the personality (as it is so far) and/or drawing a style that exudes the corresponding personality; and I like the idea of the characters resembling the areas of the city they come from. I definitely want to see more. This is the kind of thing I geek out about, because it excites me to see the potential of the medium being explored to enhance the reading experience. Power Play is, hands down, the best use of the digital medium for comics that I've seen to date, and this is only the preview. In places it reminds me a bit of the Watchmen stop-animation (or whatever it's called) video comics they did around the time of the movie, only I never had the patience to watch all of those, since I'd read the book a million times already and they moved too slowly from one frame to the next. But having the ability to read at one's own pace, and still get the animation-like effects now and again, is fantastic. Being able to see one or two panels at a time, zoomed in/close up, is great. I love the panning from one part of a panel to another and the fading from full color to monochrome for effect. Having the direction of the screen shifts follow the action is cool; or shifting to follow the narrative/captions. Also I like how he has the characters in similar poses in a couple of frames, but shifting from one frame to the next gives you the action of a head turn or tilt like in animation. This is truly the future of how digital comics should be read. I definitely wish I had an iPad so I could experience it in a bigger window, but with only a smartphone (and especially given my vision issues) this is hands-down the best way to see digital comics on a hand-held device. For comparison, I downloaded DC Comics New 52 #1 preview, which was free, and tried reading it on my Droid 2. Now, I know on a computer the usual format is fine; but on a smartphone? It's fairly unreadable. All the zooming in and panning around necessary just to see one page is a total pain, and not something I have the patience (or eyesight) for. The Power Play layout is infinitely better. I do wonder how easy it would be to translate the comic, as designed first and foremost for digital, to a print version; I know Reilly mentioned they are keeping that option in mind, but would be curious to know more about how much would need to be changed for print, and how much Reilly thinks about that when he's designing layout. (Gee, maybe I should ask him, duh.) My main thought being, naturally, how hard it would be for all writers/artists to start shifting their thinking towards designing simultaneously for both. I'm not advocating that, necessarily; I LOVE print books and don't want them to go away; but I do wonder. The preview is engaging, the art is great, and the digital format is a joy to read. I'm so getting this when it comes out. And the article and comic: Enough with Green Lantern, Bring on Deadpool! Aaaaand that's enough advertising of my own things. Now I shall advertise for others, namely, Made of Fail. My favorite podcast is still going strong, and did some fun episodes recently, on Green Lantern and the DC reboot; Harry Potter 7; and more. You should really go listen if you haven't; because it's FUN (and makes me laugh out loud on the Metro, dammit!). Also, they're doing an open call for a couple of geeky singles to go on the show for geek-relationship and dating discussion. If you're an intrepid geek in need of dating advice, go volunteer! Sir Terry will be appearing in JUST THREE cities in the United States this October for the launch of Snuff!! Make sure you go see him if you can! Washington, DC at The National Press Club on October 14 at 7:00pm. The Press Club event tickets are already on sale, and the last similar event sold out fast, so get your tickets now!! I'll be attending the NYC event, and attending AND introducing him for the DC event, so let me know if you're going to go, and maybe I'll see you there! foresthouse: Holeeee &%$=! What do you call apple brandy, apricot brandy, Grand Marnier, and orange peach mango juice? I call it delicious. RebeccaH83: @foresthouse @cutebutpsycho @lilyhandmaiden Even LOOKS like it should be called scumble! lilyhandmaiden: @RebeccaH83 @foresthouse @cutebutpsycho It really does! This is a thing of beauty. Official adult beverage of next DWCon? Seriously, y'all; it is just like the real thing. A glass of that the night of the earthquake and I was OUT. And I think it particularly appropriate that one of the main ingredients in it is applejack brandy (100 proof), historically referred to as Jersey Lightning and made right in the county where I grew up. Tue, 14:50: Man, I'd have so much fun with the chance to create a new female superheroine for one of the main DC (or Marvel) lines. And who might run programs." Well, NADWCon2011 has now come to a close, and all of us are (hopefully) home and recovering from all of the excitement and fun! I hope that everyone who attended the con had as great a time as I did, and from all reports I've heard, that seems to be the case! But then, what else could be expected after another successful Discworld convention? Amazing guests were featured; exciting programs, workshops, and games were enacted; old friends were reunited; new friends were made; inventive adventures were had; fascinating things were learned and discussed; costumes were admired; drinks were consumed; lively and hilarious conversations filled the air; and all manner of silliness was enacted in the name of Discworld -and that’s just as it should be! It's hard to believe it's been six years now since I first attended a Terry Pratchett book signing and Q & A in Arlington, VA, and innocently asked Terry whether he'd come to a North American Discworld Convention if we made one happen. It's even more hard to believe, sometimes, that he said: "Absolutely!" and that two fantastic, fun-filled conventions have now taken place! But the memories, the photos, and the uniquely Discworld Convention souvenirs (Petite Quirmignon Cow! Petite Quirmignon Cow!) remind me that this is, indeed, the case. As a co-founder of The North American Discworld Convention; as Vice Chair, Webmaster, Online Publicity Coordinator, Pre-Con Programming Coordinator, and at-con Guest Liaison for NADWCon2009; as Chair of The NADWCon Guild of Chelonavigators convention steering committee; and as Guest Liaison Co-Coordinator and Convention Advisor, and later Chair of NADWCon2011, it's been a fantastic and sometimes slightly terrifying adventure -and one that I am very proud to have been a part of. It's been a privilege to work with Terry, our other amazing guests, and all of the wonderful and talented people who have been a part of making each of the NADWCon events happen, and to witness such amazing contributions, dedication, and hard work from the Honored Guests, convention committees, staff, program participants, and volunteers. I am honored by the confidence that was placed in me and the other fans by Sir Terry and all who attended the conventions, throughout the process of putting these events on in proper Discworld style; and touched by the support and goodwill that has been extended towards myself and the rest of the convention organizers over the years. I am also very honored to have received such a high public accolade as that of being made a Dame of Discworld, and will try to do the title proud (and only show off my bloomers on very special occasions!). It probably does not need to be said, but I shall say anyway, that I love the Discworld, Sir Terry, the convention guests, the conventions, and the fans, both those who have worked hard to help make these conventions happen, and those who have come to attend and enjoy. The fictional world Terry has created, and the very real community that has been formed around it, are entities unlike any other, and are a very important part of my life. However, there sometimes comes a time when one must shift the focus of one’s attention and time, and I feel that after six years of volunteering my time to work on the NADWCons, I must now take a hiatus from convention organizing, and focus more intensely on my health (post eye-surgeries), and my career and other commitments. I truly wish there was time for me to do everything, but unfortunately my practical side knows that is not the case. I also know that there are many fans eager to see another NADWCon in 2013, and willing to work to make it happen, to which I say: Hurrah! I will be very glad to see the NADWCon tradition being continued, and will do my best to pass along any knowledge or wisdom (haha!) that I might have gained through my work on the 2009 and 2011 cons and on the Steering Committee. I must admit that I am quite looking forward to the prospect of attending future NADWCons, and finally having the chance to see and enjoy them from “the other side.” If there is to be another NADWCon, I certainly plan to be there (probably in costume!) and look forward to seeing all of my Discworld friends again both at that and at other Discworld events! And now, all that remains is for me to say a gigantic thank you and congratulations to everyone who has been or will be involved in the NADWCons! And to Sir Terry Pratchett, without whom Roundworld just would not be the same. Much love and many hugs to Sir Terry, and to all who love Discworld as much as I do. I cannot deal with the spam anymore! More substantive entries to come! *If anyone has a better fix for this, please let me know. Life Never Stops Just Because You Say "HOLD ON THERE!!!" You ever have one of those times when you'd really, really love to take some time and chronicle what's going on, but if you take literally five minutes out of your day to do so, you feel like the entire world will fall on you? Yeah, that's how I feel right now. - My sister is due to have her baby in TWO DAYS!!!!! (It's going to be a girrrrrrl.) *excited* So I will be going to watch Little Nephew while that happens. - Neil Gaiman is coming to the National Press Club in FOUR DAYS and I will be introducing him for the event, which sold out to the tune of 550 people in 3 days, and over 200 pre-sold books, and so will bring in some welcome funds for our library for working journalists (woo!). Also it will be a blast. Whee! - I don't even know what else is going on, as my whole head is full of babies and Press Club events and THE CON. THE CON THE CON THE CON THE CON CAN'T SLEEP CON WILL EAT ME THE CON THE CON THESNDFNSKDJFHNKEJRWAAKSDJ!!!!!!! Oh, sorry about that. Brain meltdown/overload. 1) A page collecting my comics to date with Marc Vuletich. We continue to write and draw for ReelzChannel.com, and it is Much of The Fun. Next up: Captain America; and The Avengers! WOOOO. Go look at ALL OF THEM so ReelzChannel knows how many people want to see our awesome comics and lets us keep doing them, which we want to do because IT IS FUN. 2) Speaking of Marc, I put him in touch with cleolinda a bit ago, so she could have some art done for some hilarious and fun t-shirts and things she wanted to put up on CafePress. The results are now live, and purchasable, and hilarious, and adorable. Go check it out. You KNOW you want a Team Sparklepire or Team Fursplode shirt; you know you do! 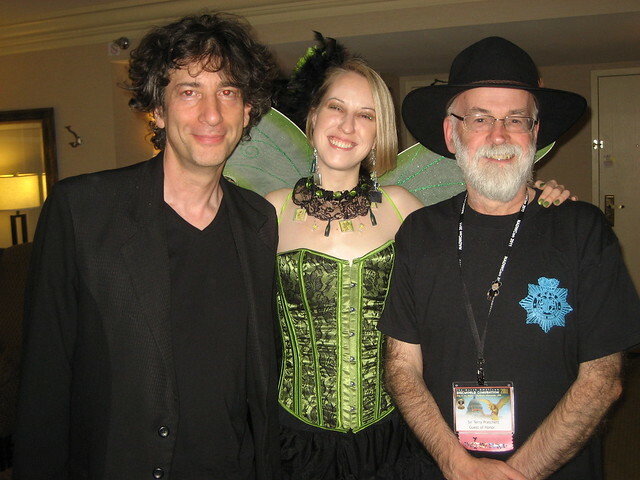 Now that the excitement of voting for me in the Neil Gaiman Audio Contest is over (thank you! still waiting for the final winner!! ), I'd like to ask people to turn their attention to another thing they can help with - donating time, money, items, or even just spreading the word to help with relief efforts in the South after the devastation caused by the approximately 178 tornadoes that ripped through Birmingham, Tuscaloosa, and other Southern areas recently. The damage is immense, and so much is needed in the areas that were hit. My friend cleolinda, who fortunately was not hit by the storms directly, but lives really close to areas that were, has done an excellent job of providing news, links, photos, videos, and most importantly, ways to help on her journal. So I am going to direct people over there for more information on all of those things. There are ways to donate money to the Red Cross, ways to buy or donate auction items for fandom and literary fundraisers, and more. Please go and read these entries, and then if you can manage to help in some manner, please do. Our friends in the South need us. LAST DAY to help me win the Neil Gaiman Audio Contest! Please vote! Hey everyone!! Today is the LAST DAY of voting for the Neil Gaiman Audio Contest, and I really need your help to stay in the Top 20 until the contest closes at 5pm EST!! I'm in 17th place right now, but faaallllliiiinngggg, so I need lots of votes to stay in the game until 5! It takes literally one minute to vote. THANKS for voting if you are already, and if you aren't, please go and vote before 5pm! !